Dried corn stalks and pumpkins in dolls house scale for a fall display. Photo ©2008 Lesley Shepherd, Licensed to About.com Inc. These scale miniature corn (maize) stalks are simple to make using easily found materials. 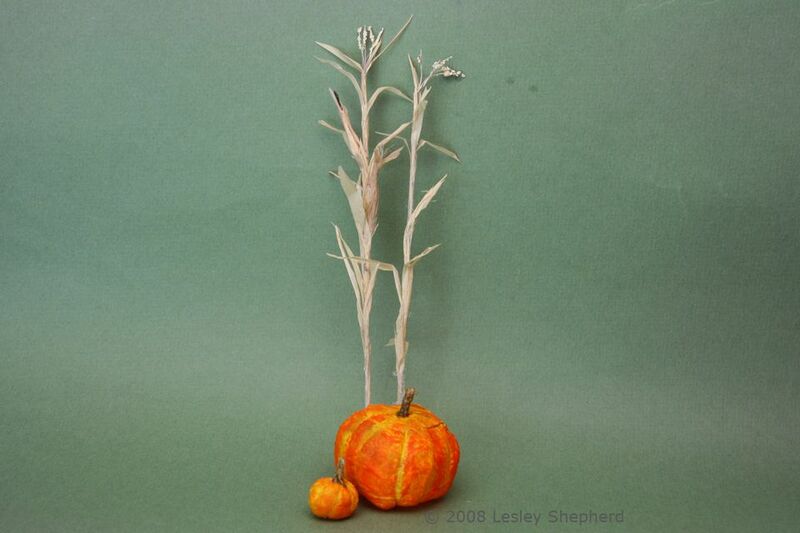 Corn stalks can be used for Thanksgiving, Halloween, or other fall scenes. They can be made dried for fall, or a fresh green for a summer scene. Corn usually grows five to eight feet in height, depending on the variety, so adjust the instructions to make corn stalks in the scale you need. Materials Needed to Make Scale Miniature Corn or Maize Stalks. Materials needed to make miniature corn or maize stalks for a scale scene. Photo ©2008 Lesley Shepherd, Licensed to About.com Inc.
Raffia or colored tissue paper or crinkled paper ribbon. For dried stalks use natural raffia or paper, for summer stalks use green raffia or paper. Note: older raffia may shred a lot. Newer, less dried out raffia will be easier to work with. Acrylic Paint in colors to match the leaves (dried or green) For summer corn stalks you will also need pale yellow for the pollen tassels. Thread use sewing or crochet thread for 1:12 scale corn tassels, use finer thread for smaller scales. Hemp twine unravelled, to use for dried corn silk for corn cobs. For summer corn cobs you can use fine yellow nylon fly tying thread. Cotton Batting- small bits from quilt batting, or the ends of cotton buds. Soft facial tissue or dryer lint will work as well. Fine Sand or another fine granular material to use for corn tassels. Lengths of thread, coated with fine sand and painted, make pollen tassels for the top of a scale miniature corn stalk. Photo ©2008 Lesley Shepherd, Licensed to About.com Inc. Begin to make the miniature corn (maize) stalk by preparing the main stems. Paint a two foot length of thread a pale green or beige color. (it is easiest to do this by drawing the thread through paint on the end of your index finger and thumb). Set the thread aside to dry. When the thread is dry, cut 1/2 inch lengths (or scale lengths which represent 6 inches if you are working in other scales) and dip these in glue, then roll them in fine sand or some other fine granular material. The sand should not coat them too thickly. Set these aside to dry. When the sand is firmly glued to the thread, paint the thread and sand beige (for dry stalks) or soft yellow (for summer stalks) Don't worry if some of the thread shows as beige or green. Set the threads aside to dry. Gather a group of five to seven threads and glue them near the top of a stalk wire as shown. Don't worry if they droop a bit. Set this aside to dry. How to shape cotton fibers into a base for a dolls house scale corncob. Photo ©2008 Lesley Shepherd, Licensed to About.com Inc.
Wrap a pointed piece of raffia around shaped cotton fibers to form a dolls house scale corn cob for a corn stalk. Photo ©2008 Lesley Shepherd, Licensed to About.com Inc.
To wrap your miniature corn cobs in leaves, take a one and one quarter inch piece of 3/8 to 1/2 inch wide raffia and trim it so that it has a narrow pointed tip on one end (see photo0. In other scales use a size that represents 1 foot, plus 1/4 inch for handling. Lay the cotton batting form down from the pointed tip of the raffia as shown in the photo. Dab a bit of glue on the pointed end of the cotton, and also near the base. Twist the pointed end of the raffia slightly at the tip of the corn cob (one half turn is enough). Twist the raffia at the round end of the corn cob to form a 1/4 inch stem. Don't worry about the way it looks just yet. Miniature corn cobs with corn silk made from thread, ready to attach to a corn stalk. Photo ©2008 Lesley Shepherd, Licensed to About.com Inc.
Take 1/4 to 1/2 inch strands of fiber from a scrap of hemp twine, or take fine fly fishing thread, or nylon thread you have separated into tiny fibers. Dip the base of the fibers or threads in glue, and lay a small group of these fibers so they stick out the top of the corncob, just below the pointed end of the first leaf you placed in the last step. Take a final leaf and lay it so that it covers the edges of the previous leaves, completely surrounding the corn cob. You should be able to see three small leaves on the top of the cob, with the 'silk' in the center. The base should form a twisted stalk. Use tweezers to bend the short pointed sections of the leaves at the top of the cob so that they bend away from the cob. Trim the twisted ends at the base of the cob to form a 1/4 inch stem and glue this stem if necessary. Set aside to dry. Two to three inch sections of raffia or paper are wrapped around a wire stem, then the lengths are bent away and trimmed to form leaves. Photo ©2008 Lesley Shepherd, Licensed to About.com Inc.
Once the scale corn pollen tassels at the top of the wire stalk have dried, start to add the leaves, beginning at the top of the stalk. To make the leaves, cut three, one inch (or scale equivalent to one foot) sections of raffia or paper, approximately 1/4 inch wide, and shaped to a flat base and a long, narrow pointed tip. (view photos of real corn stalks if you need to check the shape). Run a bead of glue along the wire at the top of the corn stalk, and glue the bottom 3/8 of an inch of the leaf around the stem, making sure you cannot see the top of the wire, and leaving the tassel threads free. Place another leaf along the stem opposite the first, and glue it to the wire, covering the base of the leaf on the other side. Continue to place leaves down the stem of the corn stalk, alternating increasingly longer leaves (up to 2 inches or two scale feet in length.) If you are making stalks without corn cobs, keep adding longer leaves until you reach the bottom 1/4 inch of wire. Set the stalk aside to dry. If you want to add corn cobs to a stem, glue four or five leaves in place on the stalks that will have cobs, and proceed to the next step. Setting a miniature corn or maize cob onto a scale model corn stalk. Photo ©2008 Lesley Shepherd, Licensed to About.com Inc. When the cob is glued to the stalk, place a leaf just below the corn cob so that it covers the corn cob base and wraps around the wire stem, enclosing the base of the corn cob in the leaf. You should not be able to see any sign of the corn cob stem or base. Glue the leaf in place. Continue to add corn cobs until you have as many as you want on each stalk. Make sure the leaves get longer and a bit wider as you go down the stalk. A finished dolls house scale corn stalk for a scale miniature display. Photo ©2008 Lesley Shepherd, Licensed to About.com Inc.
To finish your scale miniature corn stalk, trim the leaves from the base to the tip to tidy up the leaf shapes. If you work from the tip to the base your raffia may shred, not a problem for dry corn stalks, but it may ruin the shape of summer green corn stalks. Leaves on a corn stalk usually have a fold on the leaf rather than sticking out straight. Use tweezers to bend the leaves between 1/2 and 3/4 of an inch from the tip (see photo). Plant your miniature corn stalks by gluing the wire base into dry floral arrangement foam or other base foam of your railroad or dolls house scene.